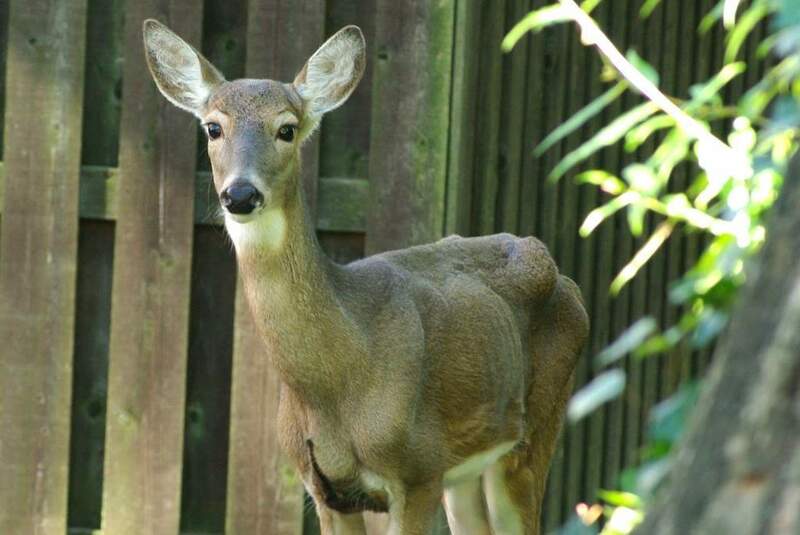 I've written before about the deer that visit my yard, eating the euonymous bushes that I keep around only for them, pruning my roses for me, hanging out, or just passing through. They come through twice a day at least I think, but I only see them once in a while -- it depends when I'm looking out there. Early morning is a good time for a sighting. 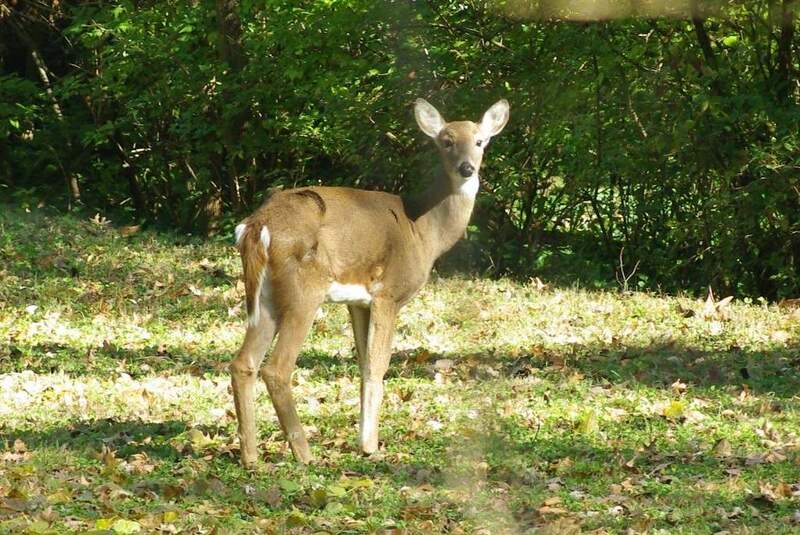 When I see them later in the day (mid-morning, or even early afternoon), that's less common, but when I saw this deer today I knew something was wrong. When I first saw her she was standing right where the cypress vine pole was that I removed the other day. That's not unusual, as I've seen deer stand there feeding before -- usually in winter. 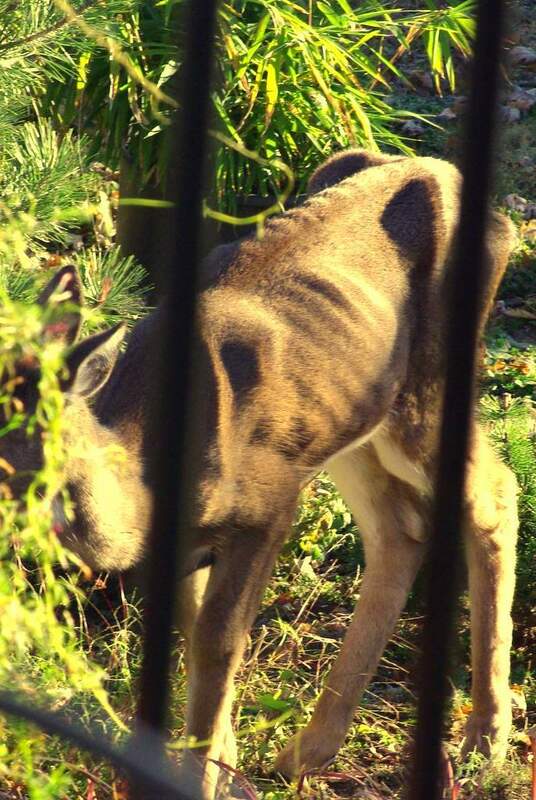 What was unusual though was how slowly this deer moved. I couldn't really get a clear shot of her from the window, so after snapping a few shots I stopped worrying about photos and just watched her. She disappeared behind my little-too-large knockout rose, and I didn't know what happened to her for several minutes until I saw the rose bush moving around -- she was chomping on it. Seeing her condition and since growing season is over I wasn't concerned about the rose -- less pruning for me in the spring, right? I was glad she was eating something. 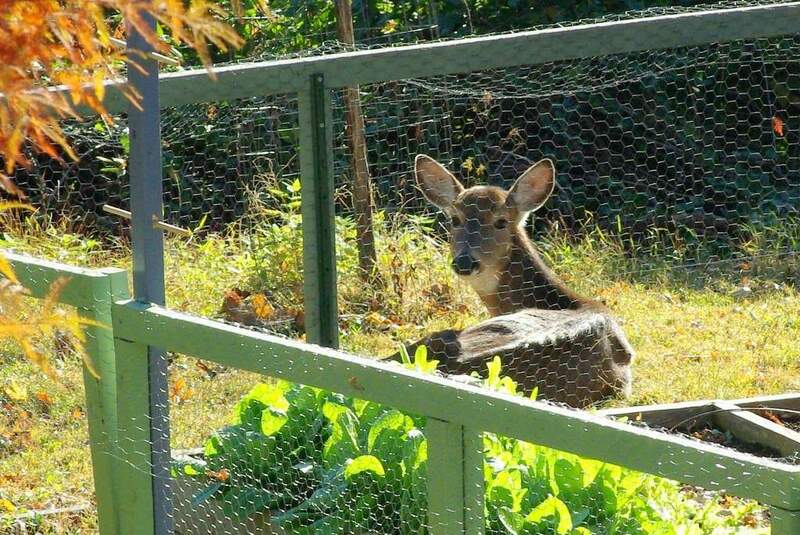 She was laying down behind my neighbor's fenced veggie garden. I was really concerned that she wasn't going to get up again because she looked so weak. 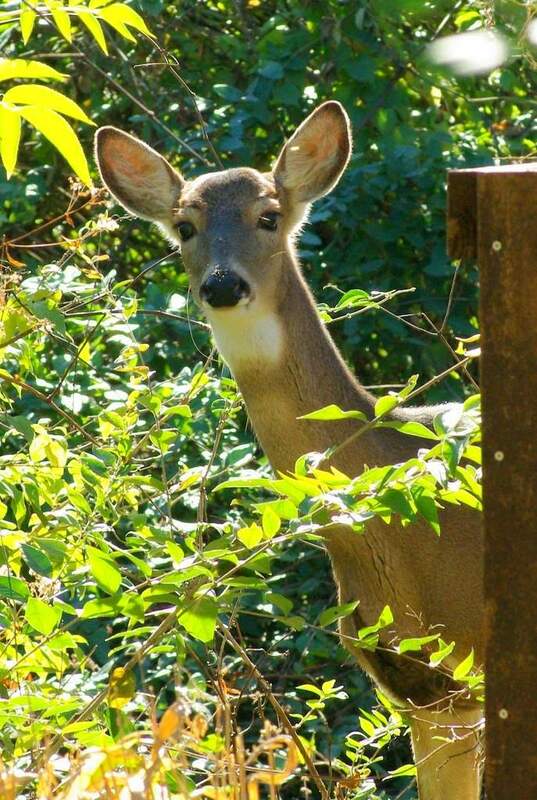 She was just resting though, since she heard me move around on the deck to get a better view and turned to watch me. I decided to leave her alone so she could rest, and came back some time later. She was standing up in this same area, but moving back toward my yard (which is only 20 feet to the left in that photo). I decided to take the camera back there and try to get some closer photos. 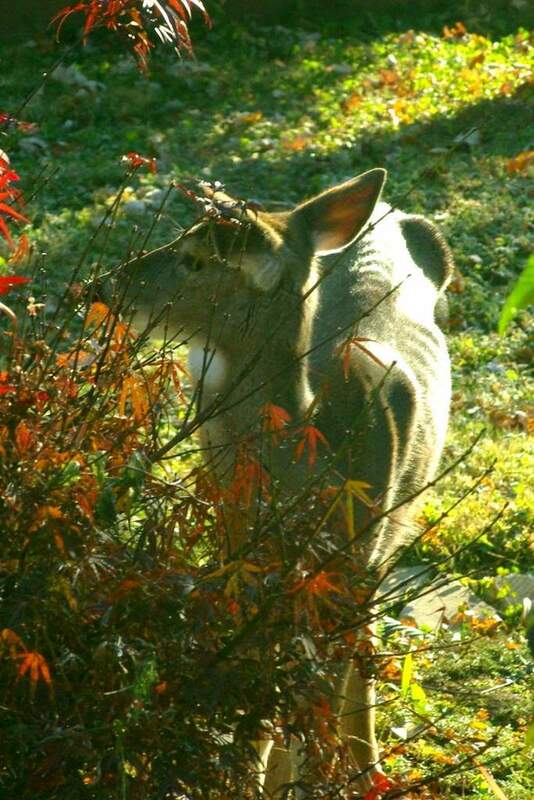 Since there are several bamboos, my woodpile, and a large forsythia between where she was and where I approached from, I was pretty sure I could get in position and snap some shots when she came around the bamboo. I saw her go behind the bamboo, but after several more minutes she didn't emerge from the other side, so I took a chance and circled around from the left. There were a lot of leaves on the ground so it was impossible to walk quietly, but I did my best. When I got all the way around, she had disappeared! I again decided to leave her alone, so returned to the house. Some time later I looked around for her again, and couldn't find her. As I was going into the garage I spotted her in my other neighbor's yard (on the other side), as she was slowly making her way around their house. That's one of the two typical paths that the deer take, and it would force her to go into my neighbor's front yard and across the street. 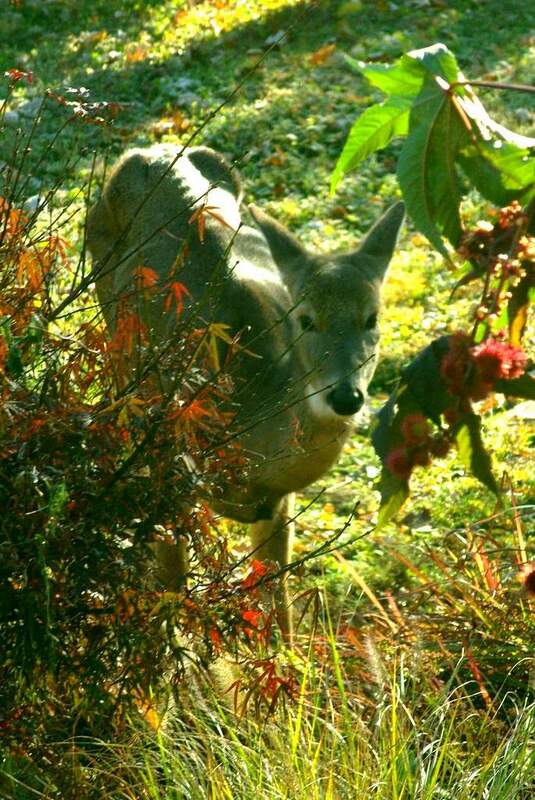 I got busy with working in the yard, and only later when dropping some vines onto my compost pile did I see her back in the bushes (seen in the background in the above photo). 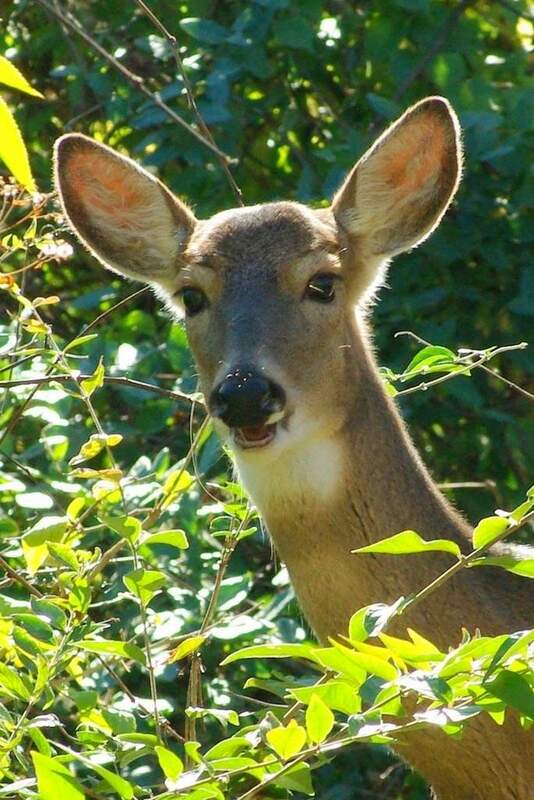 I hope whatever is wrong with her is not contagious, because as much as the deer around here are a nuisance and cause a lot of damage, I don't wish for them to suffer. 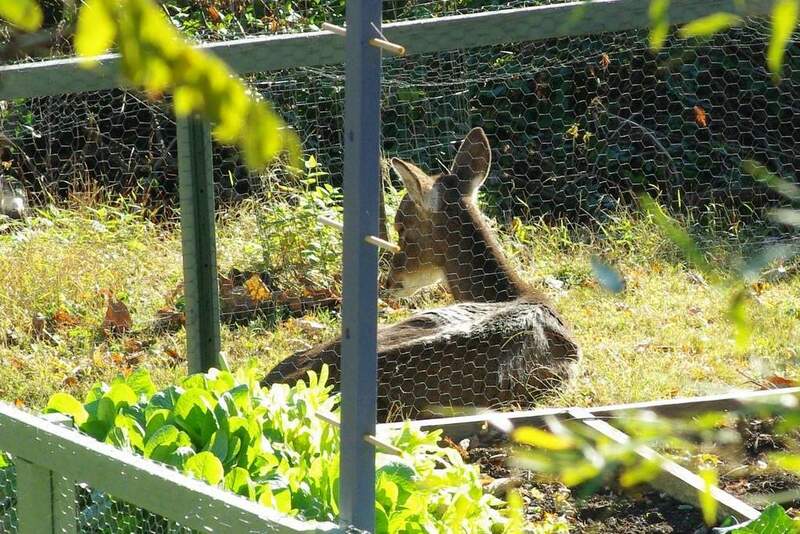 Get well soon deer, so I can go back to cursing you out for eating my roses! I contacted MDC about this and am awaiting a reply.